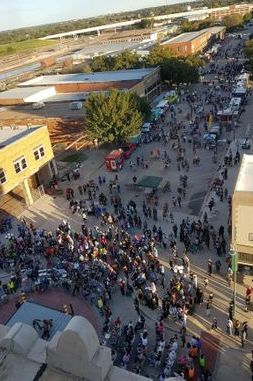 Crowd of close to 2,000 flowed down Ohio Street where Food Trucks lined the streets and wrestling matches entertained the crowds! Short Sleeve Sampson greets fans from around Texoma this past Saturday, October 8th. Wrestling Fans enjoyed meeting Short Sleeve Sampson, Tokyo Monster Kahagas, Prince Akeem and Hillbilly Jim as an added fundraiser for the PWHF. This is just one of many Meet & Greet opportunities held at the Professional Wrestling Hall of Fame and Museum throughout the year. Thank you to legendary man of the ring, Hillbilly Jim for bringing great awareness to the PWHF and the Museum this weekend. 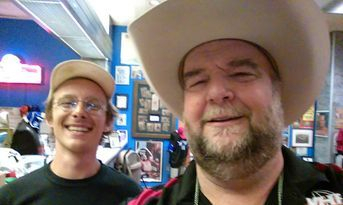 Shular Roberts (shown here with PWHF Board President Johnny Mantell), a student from Texas State University in San Marcos, TX, spent a little over three hours at the PWHF on Sunday, 11/6/16 looking through the memorabilia, talking about the impact on tourism the PWHF has had on Texoma and interviewing Board President Johnny Mantell for his Nature Heritage Tourism Planning & Development class. The PWHF is a non-profit organization and Museum that welcomes students and fans of all ages, one of the many reasons the PWHF is here. Shular is from the Wichita Falls area and was excited about writing his paper about the PWHF. He said all his classmates were visiting National Parks & Monuments but he felt that the tourism impact on Texoma was just as significant, plus no one else had written about the PWHF before!! Thanks Shular and the Roberts Family!! 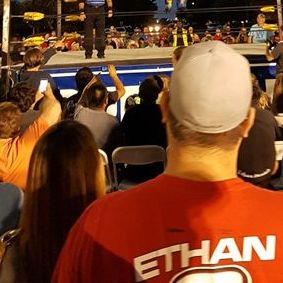 That City Show's own, Eric Crosslin, was the special guest referee during the 3rd match of the night. Old School Wrestling (OSW) presented an amazing show with 5 matches. Family friendly, fun for all ages just like when wrestling was regular family fun live from the 4H Barn in Wichita Falls or from the Sportatorium in Dallas, the Olympic in LA, or any other wrestling venue back in the day!!! Mrs. Ata Maivia Johnson accepting her father's, High Chief Peter Maivia, induction into the 2016 PWHF Hall of Fame class. PWHF President, Johnny Mantell gave the induction speech; Mr. Mantell drove the High Chief around Los Angeles at the ripe old age of 18, what an experience that must have been for a young man just starting in the business. 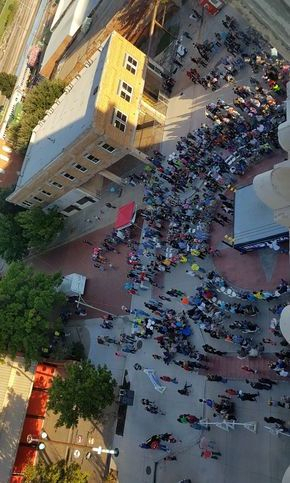 RIBS, Inc. provided one amazing pure TX BBQ Rib meal for the entire crowd. 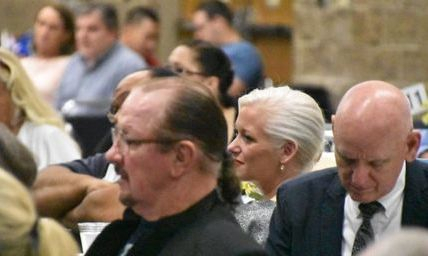 Banquet attendees enjoyed the evening as Hall of Famer Terry Funk awaits his turn at inducting Greg "The Hammer" Valentine. Thank you to Greg Oliver, Steve Johnson and all the amazing CANOE - Slam Sports writers for the Inductee Bios, support and this great article by attendee Carmine Despirito!! The 51st Cauliflower Alley Club held this year at the Gold Coast Casino in Las Vegas was a interesting and productive convention to attend. It was started 51 years ago in Los Angeles as a convention for boxing, wrestling and other combative sports throughout the World; a time where just the "boys" could get together to reminisce and hang out without people asking for autographs and photos every time you turned around. Several years ago, it was moved to Las Vegas and the Club was opened up to a membership organization where anyone interested could join the Club. It is a non-profit organization that uses it's membership to provide help and scholarships for deserving men, women and children of wrestlers. 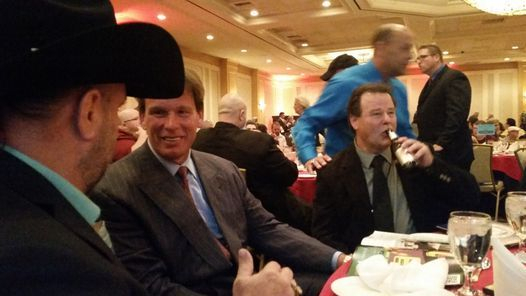 Cowboy Johnny Mantell attended one convention back in Los Angeles when his brother, Ken Mantell, was the NWA Jr Heavyweight Champion, and this year returned to represent and promote the PWHF and it's new home. It was great seeing old friends, meeting new ones and finally putting faces to all those names we all talk to everyday online! We had a great time, handed out more than 1,000 cards regarding the PWHF and Wichita Falls, TX and most important cemented friendships for the PWHF future!! The Memorabilia Displays available to look through at the CAC Nostalgia Room. Wrestlers and organizations from across the country had tables with items for sale at the CAC Nostalgia Room. 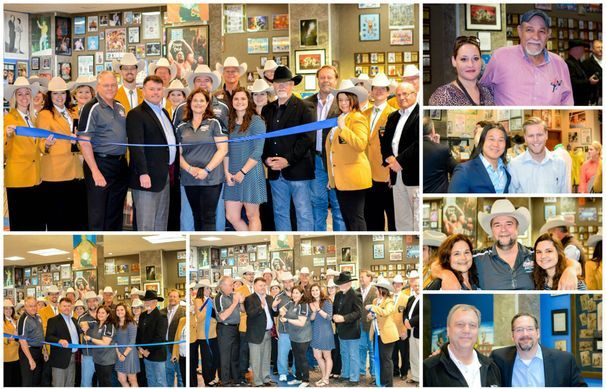 Close to 150 citizens from around the Wichita Falls community and around North Texas walked through the PWHF and Museum this morning during the Wichita Falls Chamber of Commerce and Industry ribbon cutting. Thank you so much to their Board and the Gold Coat Ambassadors who attended this morning's event. We also want to thank the PWHF Board of DIrectors and Keith Mundee from American Hat Company for attending this morning. It was great watching everyone's faces walking through today reliving their childhood memories!! 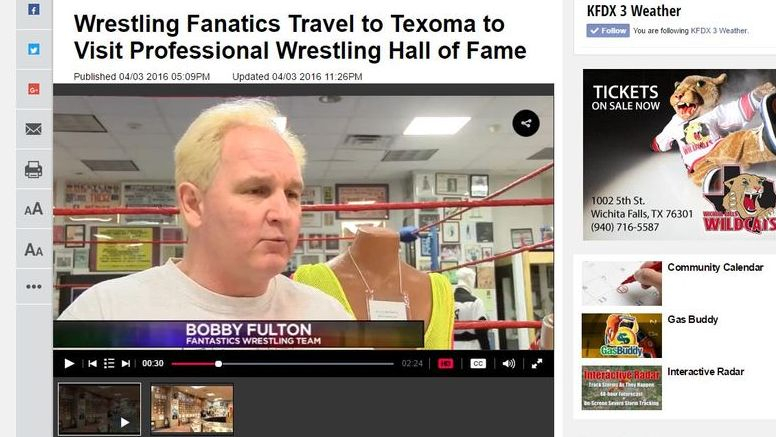 So come spend an hour or more viewing the worldwide history of Professional Wrestling right here in Wichita Falls, TX. Saturday, March 12th will forever be in the memories of over 200+ men, women and children when the PWHF Board of Directors opened up one room of the Museum for a sneak peek. It was amazing watching the smiles on everyone's face looking through the only 20-25% of items on display as they brought back memories from their youth, times with relatives or as they were teaching their children about "when wrestling was real". We can't wait to have the entire museum ready and open to the public. We have had emails and messages from around the country asking if the museum will be open for Wrestlemania travelers, and the answer is YES, we will be open. Watch the website for dates and times of operation. The PWHF will also have a booth at the WrestleCon event April 1st & 2nd in Dallas! Watch all of our social media for updates, booth locations and photos from upcoming activities!! 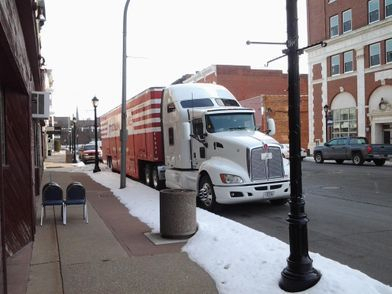 Follow the move through the PWHF Facebook page with photos and videos along the way to Texas. 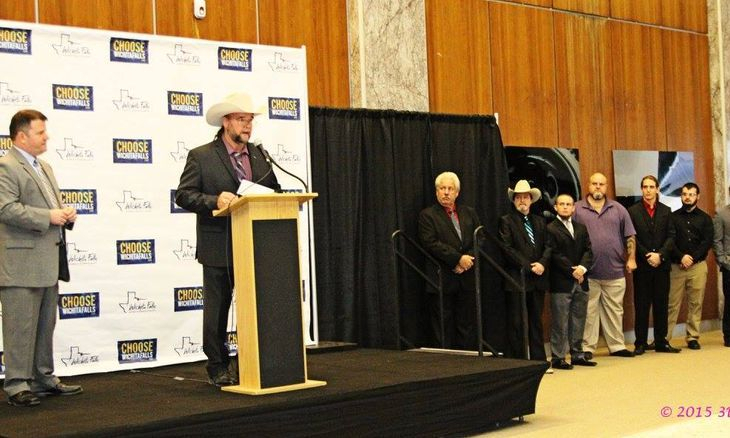 The announcement of the move of the Professional Wrestling Hall of Fame & Museum to Wichita Falls, TX where it will make it's home in the annex of the First Wichita Building, fondly known locally as the Big Blue, was heard far and wide on Thursday, November 19, 2015. The news was #1 trending on Facebook and trending on Twitter Friday afternoon. 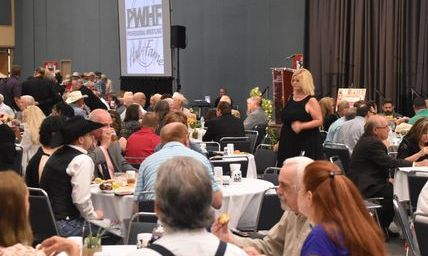 Citizens, community leaders and all the local news media came to the Big Blue to hear the news and the list of the 2016 PWHF Inductees. The list which includes a Texan will be inducted on May 21st, at the 15th Annual Induction Banquet to be held at the MPEC. 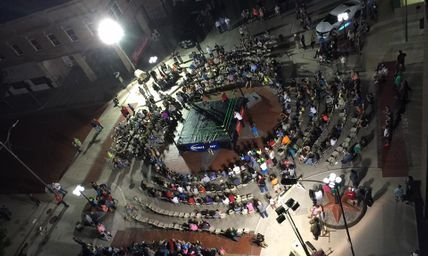 Wichita Falls, TX has been the site of many title changes throughout the history of professional wrestling. During the early days of the sport through the 1980s, any wrestler with a name in the sport wrestled in Wichita Falls, TX. We are proud to bring the PWHF to Wichita Falls and become the anchor tourism destination for the area. Johnny Mantell, at the podium, makes the announcement of the 2016 Inductees with wrestlers from past, present and future looking on. 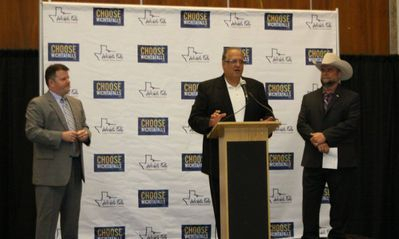 Tony Vellano, current PWHF President, makes the announcement in the lobby of Big Blue with Wichita Falls Chamber of Commerce President (on left of stage) and Johnny Mantell (on right of stage). 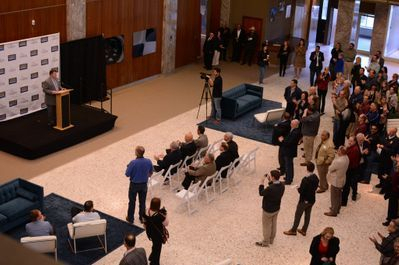 A look from the 2nd floor of the lobby at the VIPs, attendees and community who showed up for the "Big Announcement"
Thank you to 3B Photography and the Wichita Chamber of Commerce for taking photos from the announcement and allowing the use of them for the website. Thank you to Shannon, a local artist, for taking a vision a creating the portrait. This is just a rough draft of what we hope will be a wonderful addition to the PWHF's in Wichita Falls, TX. We are looking for other unique and artist individuals to lend your creative flare to the Hall! We are open to talk with anyone about their art and passion for Professional Wrestling and the history of our great sport!! To the left is the original painted for the "Big Announcement"
Below is the final painting that now hangs just above the original Sportatorium sign in the Museum. We can't thanks Shannon enough for this amazing gift to the PWHF. What an Amazing Artist.... Thank you!! An amazing painting of Big Blue, downtown Wichita Falls and our history flowing from the windows..... This will looking beautiful hanging in the Museum soon!! 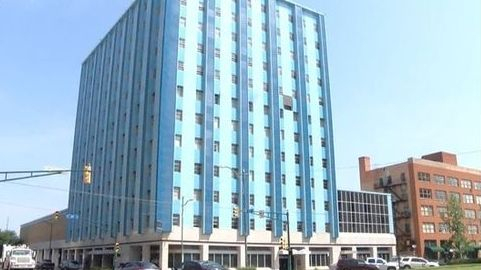 But until then, it will be live and in color at the Wichita County Tax Assessors office's in downtown Wichita! Stop by and say Hi to Tommy Smyth, the PWHF Board of Directors Vice President.... The entire Board of Directors wants to send special THANK YOU's to Shannon Reese-Gaumont for this wonderful gift to the Hall!! !